When you want to change your style, one of the fastest and easiest ways to do it is to change your hair. And when it comes to your hair, you have a lot of options. There are extensions, and even wigs, that will instantly give you an exciting new look. But the problem with these options is that some people, especially your closest friends, are going to spot them from a mile away. 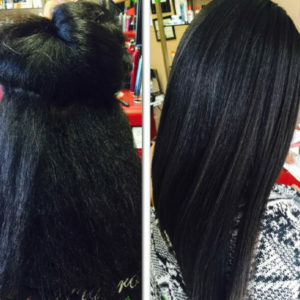 If you want to make a dramatic change to your look and still look like, well, you, all you need to do is to straighten your hair with a Brazilian keratin hair straightening treatment from Maria Teixeira. Braids, wild hair colors, and other drastic effects may give you dramatic reactions. But these are fun, short-term solutions. They might be good for going out for the night or going away for the weekend, but do you really want to wear them to work Monday morning? In the long term, a more natural look is going to give you the results you want, which is to be sophisticated while still maintaining your professionalism and personal style. That’s where Brazilian keratin hair straightening can help. There are no wigs, extensions, or other unnatural additions. It’s just your own natural hair straightened, strengthened, and left looking luxurious and lush. Best of all, keratin won’t wash out or fade after a few days or even a few weeks. Your professional Brazilian keratin treatment can last up to a month or even longer with little or no additional care on your part. So when you want to upgrade your look, don’t opt for the short-term solutions your friends will notice right away. Instead, go for the gold with a Brazilian keratin hair straightening treatment by Maria Teixeira at your local professional hair salon. You’ll be glad you did!